I've been cooking a lot with artichokes this week. Till I post recipes I hope you enjoy this sneak peek. 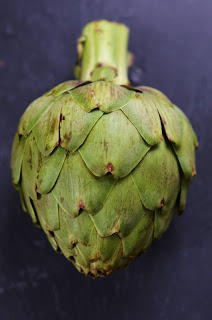 We host an online seasonal potluck and March is artichoke month for us as well! I'd love if you'd stop by and link up your creations once they are made! http://bit.ly/zRfNjo I'll definitely check back with you for some inspiration! Sounds nice. I hope to post tomorrow, Sunday. I need to cook it again. I will make it for lunch tomorrow. Lovely clicks! A delightful veggie. TY so much Rosa. Isn't it?! You know I will be back here since I love artichokes! :) Yep you and your green thumb Annapet. SO lucky you are in Northern California. I remember the artichoke fields from my visits. I'm a big fan of artichokes... Can't wait to see what you've done with them! Me too Bri. You would love it. Posting tomorrow I hope. Looking forward to your post on artichokes. They can by mysterious to handle without knowing how to! Such a pretty veggie! We had artichokes Monday night. They are one of the veggies both of my kids really like :-). Looking forward to your recipes Shulie! Ooh kids who like artichokes are very sophisticated. My son am not sure how he feels about them??! Wonder what you made with them?? 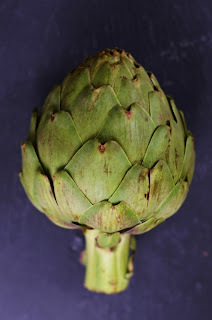 Can't wait to see some recipes, and see nicer artichokes in our markets! Gorgeous pic as always dear! TY Nelly. I know what you mean. Lucky Californians. I hope to post by tomorrow.